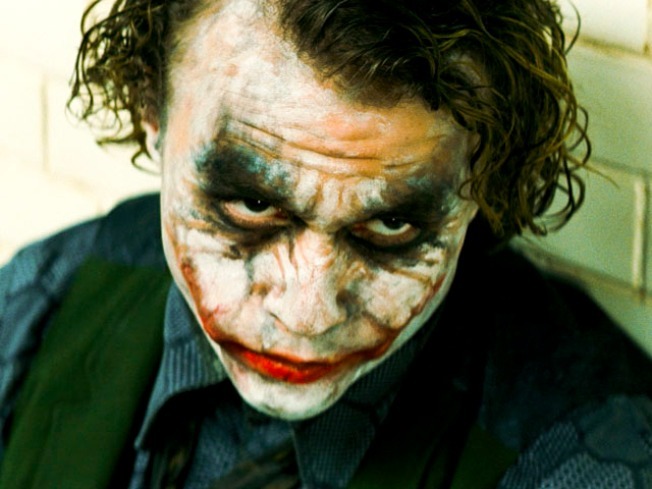 LOS ANGELES – Heath Ledger's sociopathic reinvention of Batman bad guy the Joker in "The Dark Knight" has earned him the supporting-actor honor at the Screen Actors Guild Awards. His co-star Gary Oldman has accepted the prize on behalf of the late actor. The win puts the late actor a step closer to becoming just the second performer to win a posthumous Academy Award. Oscar buzz has been flying over Ledger's performance since before his death just over a year ago from an accidental overdose of prescription drugs. With the SAG win and the Golden Globe, Ledger now looks like a virtual lock to receive the supporting-actor Oscar on Feb. 22. Meryl Streep of the Roman Catholic drama "Doubt" and Sean Penn of the Harvey Milk film biography "Milk" won lead-acting honors and the prize for overall cast went to the rags-to-riches saga "Slumdog Millionaire"
"Can I just say there is no such thing as the best actress, there is no such thing as the greatest living actress," said Streep, the Academy Awards record-holder with 15 acting nominations, including one for "Doubt," in which she plays an old-school nun in a war of wills against a progressive priest. "I am in a position where I have secret information, that I know this to be true," she said. "I am so in awe of the work of the women this year — nominated, not nominated — so proud of us girls. And everybody wins when we get parts like this." Penn played gay-rights political pioneer Milk but said the film had a universal theme. "As actors, we don't play gay, straight. We don't play any of these kinds (of roles). We play human beings, and this movie is something that all of us involved are so proud of," Penn said. "This is a story about equal rights for all human beings." Kate Winslet won the supporting-actress prize for her role as a former concentration camp guard in "The Reader." Winslet offered a tribute to the late Anthony Minghella and Sydney Pollack, both producers on "The Reader," and said 2008 was a fabulous year for films. "It's really an honor to be included in what I think is such a remarkable year," Winslet said. "I really feel like everybody should be given a medal." The role already earned Winslet the same prize at the Golden Globes, where she also won lead dramatic actress for "Revolutionary Road." But at the Oscars, Winslet has just one nomination, as lead actress for "The Reader." As it did at the Golden Globes, "30 Rock" swept the TV comedy honors, Tina Fey and Alec Baldwin taking the individual acting prizes and the show winning the ensemble cast award. Joking that one day, her young daughter would be old enough to watch reruns of "30 Rock" on the Internet, Fey said, "She'll look up at me and say, `What do you mean, you don't get residuals for this?'" Hugh Laurie, won his second straight SAG prize for best actor in a TV drama for the medical show "House," joked that he was disappointed one of his fellow nominees did not win. "I actually had a hundred dollars on James Spader (of "Boston Legal")," Laurie said. "This is just not my night." Sally Field earned the TV drama actress award for the family series "Brothers & Sisters," while the advertising saga "Mad Men" was named best drama show. Accepting alongside his cast mates, "Mad Men" star Jon Hamm had kind words for the show's "dozen of viewers." Before the show, "The Dark Knight" won SAG's honor for best movie stunt ensemble on Sunday, while "Heroes" took the same prize for television. The stunt honors were announced on the red carpet as stars were arriving for the awards, one of Hollywood's last big ceremonies on the road to the Feb. 22 Academy Awards, whose nominations have lined up to make the SAG honors a real prelude to the Oscars. Just three days before the SAG Awards, the Oscar acting categories came out virtually in sync with the guild picks, with 18 out of 20 performers competing for the same prizes at both shows. The lead-acting categories feature the same people in the running at both shows. Among other lead-acting nominees for SAG and the Oscars: Streep for "Doubt"; Anne Hathaway for "Rachel Getting Married"; Penn for "Milk"; Mickey Rourke for "The Wrestler"; and a Hollywood power couple, Brad Pitt for "The Curious Case of Benjamin Button" and Angelina Jolie for "Changeling." SAG supporting-actress nominee Taraji P. Henson, who's also nominated for an Oscar for her work in "The Curious Case of Benjamin Button," was among the first stars to arrive. Henson signed autographs for fans and posed for photos before talking to media on the red carpet. The late Heath Ledger loomed large at last year's ceremony, his death coming just five days before the SAG Awards. Actors spoke reverently of him, and Daniel Day-Lewis dedicated his best-actor win for "There Will Be Blood" to Ledger. This time, Ledger is viewed as a near lock to win the supporting-actor honor for his ferocious reinvention of Batman villain the Joker in "The Dark Knight." Nominated for overall cast performance are four of the five best-picture Oscar contenders: "The Curious Case of Benjamin Button," "Frost/Nixon," "Milk" and "Slumdog Millionaire." The fifth SAG cast nomination went to "Doubt," while "The Reader" has the fifth Oscar best-picture spot. While individual categories at SAG are a solid forecast for who might win at the Academy Awards, the overall-cast category has a spotty record at predicting the Oscars. "No Country for Old Men" won at both SAG and the Oscars last year. But winners in those categories have lined up at both shows just six out of 13 years since SAG added the cast honor. Airing live on TNT and TBS, the 15th annual SAG Awards planned a lifetime-achievement honor for James Earl Jones.